In addition to the three Step Charging Campaigns launched for Middle-east and Far-East Asian destinations in August, October and November 2009 respectively, Telenor gives another offer. 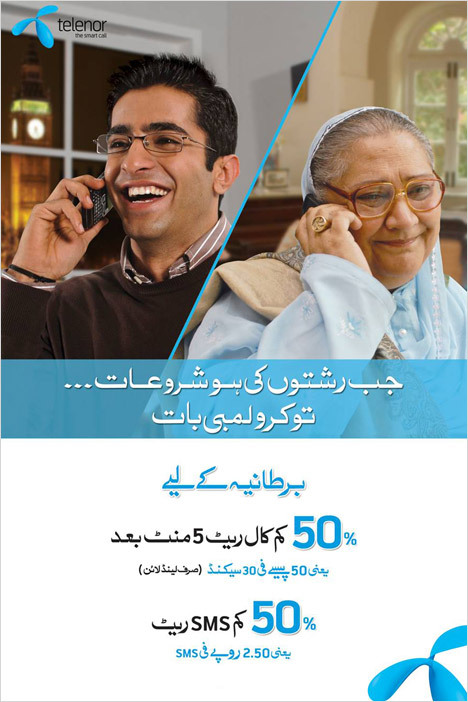 Get 50 percent discount on all calls and SMS to UK. 50 percent discount applies on UK landlines after first 5 minutes of the call. Discount only available for Non-FNF UK-L numbers. This offer is Not Available on FNF Numbers. All numbers entered as FNF will continue to be charged at flat rate of Rs. 0.75 per 30 sec. The offers will be available to all Prepaid and Postpaid subscribers by default and they don’t need to subscribe for it. I can give you unlimited UK landline, USA (landline & cell) and calls to 35 countries for free for 90 days in just Rs.1500, not just this you will be able to make 300 minutes cell phone OR 600 minutes of landline calls to Pakistan. LOLZ… where do you from ..MARS?